Recent drill results from Southern Silver Exploration Corp.'s (SSV:TSX.V; SSVFF:OTCQB; SEG1:FSE) Oro deposit in New Mexico identified a widespread gold system at the Stockpond target. The company announced on Nov. 23, 2016, that drilling "intersected widespread alteration and a thick zone of strongly anomalous gold mineralization in a sediment-hosted oxide-gold system located on the edge of the drill pattern, which remains open laterally to the east, north and south under thin gravel cover." Nine reverse circulation holes were drilled during the exploration program, totaling 1,223 meters. Hole SP16-004A contained the highlight of a "9.1 meter interval averaging 0.75g/t Au, contained within a 41.2 meter interval averaging 0.42g/t Au." The company noted that, "the results from this initial program were successful in identifying the edge of a potentially large auriferous mineralizing system and in particular, showing open vectors to the east of the Phase I drilling which will now be the focus for further surface exploration, geophysical studies and an eight to ten hole, wide-spaced drill program covering an approximate five square kilometer area." Southern Silver President Lawrence Page, Q.C. noted that "Oro remains a most attractive porphyry copper/gold target with distal gold values. We have expanded our land base with the addition of located mineral claims and now intend to vigorously continue exploration for a significant gold resource in the northeastern portion of the property where values of gold discovered to date, are similar to those being mined in other major oxide gold deposits throughout the western United States." 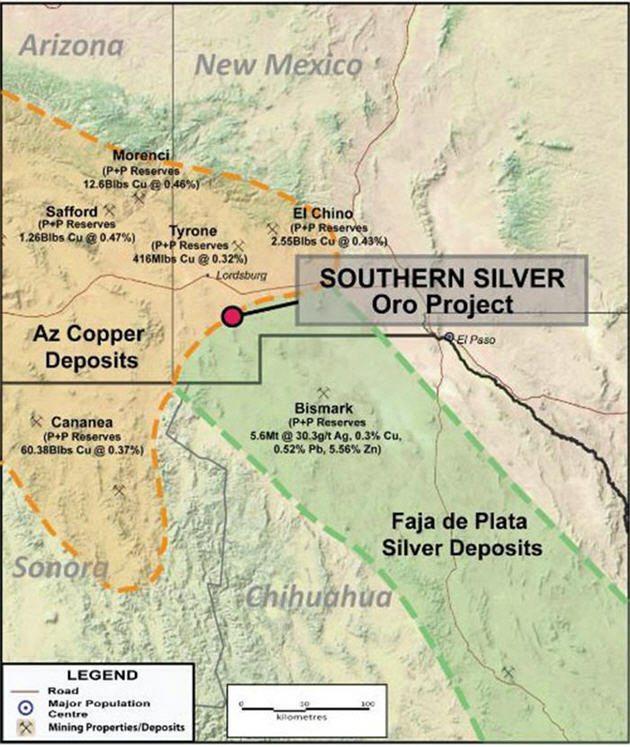 Southern Silver has been able to consolidate the Oro land package; it is made up of patented land, state leases and Bureau of Land Management located mineral claims. There is a 2% net smelter return (NSR) royalty. Southern Silver noted that "management is very encouraged by the results and has subsequently staked an additional 54 lode claims on BLM-administered land on the Oro project, covering potential extensions of the Stockpond mineral system and the other potential targets. In addition, the company has begun the process of planning and permitting for additional drill sites to test an approximate five-square-kilometer area to the east of the current drilling." Martin Wood of Vicarage Capital, on Nov. 4, 2016, before Oro's drill results were released, noted that "the area drilled covers a gold-in-soil anomaly and mineralised outcrop exposure where rock-chip samples returned up to 4.8 g/t Au. The dimension of the gold anomaly coupled with the sampled grades underscore the project's potential for the discovery of a significant bulk-tonnage, intrusive-related, disseminated oxide-gold deposit." The Oro property is situated in the historic Eureka mining district, an area that has been mined since the early 1900s. Southern Silver's original project is Cerro Las Minitas in Durango, Mexico. Three high-grade silver-lead-zinc deposits have been outlined there, and a high-grade gold deposit was recently discovered. Electrum Global Holdings LP has earned a 30% indirect interest in the property and has until May 2019 to earn up to a 60% indirect interest. 1) Patrice Fusillo compiled this article for Streetwise Reports LLC and provides services to Streetwise Reports as an employee. She owns, or members of her immediate household or family own, shares of the following companies mentioned in this article: None. She is, or members of her immediate household or family are, paid by the following companies mentioned in this article: None. 2) The following companies mentioned in this article are sponsors of Streetwise Reports: Southern Silver Exploration Corp. The companies mentioned in this article were not involved in any aspect of the article preparation. Streetwise Reports does not accept stock in exchange for its services. The information provided above is for informational purposes only and is not a recommendation to buy or sell any security. 5) From time to time, Streetwise Reports LLC and its directors, officers, employees or members of their families, as well as persons interviewed for articles and interviews on the site, may have a long or short position in securities mentioned. Directors, officers, employees or members of their families are prohibited from making purchases and/or sales of those securities in the open market or otherwise during the up-to-four-week interval from the time of the interview or article until after it publishes.